Teenaged Jeanne Beker, clad in a yellow bikini, gets down with the sounds of Ronnie Hawkins at the Toronto Pop Festival. Photos by Dave Cooper. The Telegram, June 26, 1969. I jumped onstage in a yellow pompom-trimmed bikini top for an impromptu dance with the legendary rocker Ronnie Hawkins. A large photo of this suburban kid — and I was identified by name — boogying her brains out as the Hawk did his mean rendition of “Hey! Bo Diddley” appeared in the Toronto Telegram the next day. Of course, my mother was mortified, but I was proud as punch. The whole experience was downright exhilarating, and it unquestionably contributed greatly to who I am today. And thus, alongside his nurturing of musical legends like the Band, Ronnie Hawkins inadvertently helped the career of Jeanne Beker. 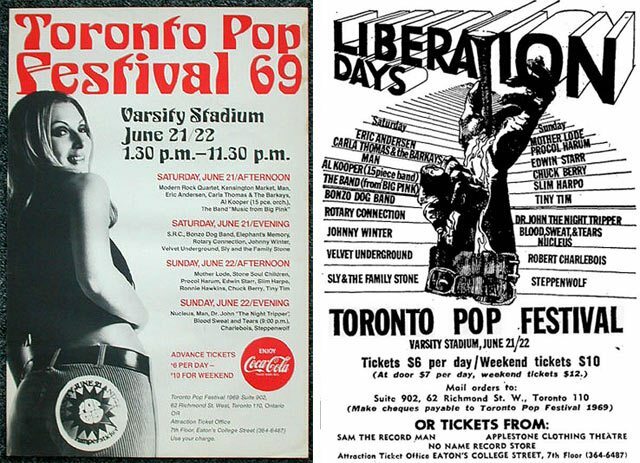 Left: poster for the Toronto Pop Festival. Right: advertisement, the Globe and Mail, June 7, 1969. Unlike the decisions facing music lovers this weekend—which NXNE shows are worth checking out or whether to grab a ticket to a remaining Luminato performance—attendees of the Toronto Pop Festival had a simple choice: go for one day or two? Besides the announced line-up of performers ranging from Memphis soul (Carla Thomas and the Bar-Kays) to Quebeçois chansonniers (Robert Charlebois), there were unannounced, little-known acts whose anonymity wouldn’t last much longer (Alice Cooper, who was not to be confused with fellow performer Al Kooper). Reviews of the festival were positive, with much praise for how smoothly the event ran. Incidents like a burned-out amp during the Band’s performance, a brief rain shower Sunday evening, and isolated bad trips were treated as minor mishaps. Unlike recent American festivals, violence didn’t flare up between the 60,000 ticket holders and police; the cops, some of whom were grooving in rhythm with the rest of the crowd, admitted that enforcing pot laws would have stirred trouble and let the audience enjoy the grass that wasn’t part of the field. 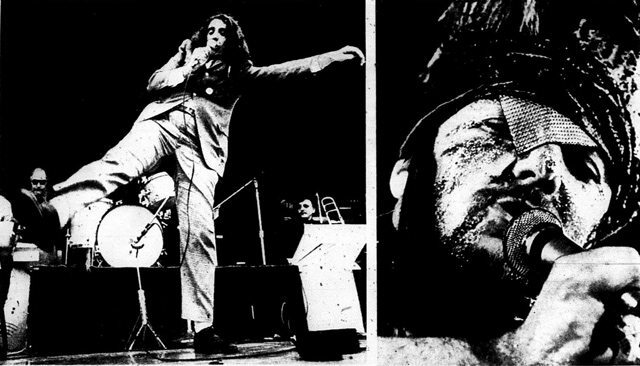 Tiny Tim shows his frenetic singing style and Dr. John sports a head band and coloured speckles as part of his full formal tribal gear.” The Telegram, June 23, 1969. While the hot acts of the moment (Blood, Sweat and Tears; Sly and the Family Stone) entranced the audience, it was old-timers like Hawkins and Chuck Berry who brought out the energy in the crowd. As Peter Goddard noted in the Telegram, before Berry’s Sunday set the event felt like individual concerts; after Berry shouted “Long live rock and roll,” everyone in the audience swung to “some inner beat” and the show truly felt like a festival. The artistic and critical success of the festival paved the way for the Toronto Rock n’ Roll Revival headlined by John Lennon a few months later. 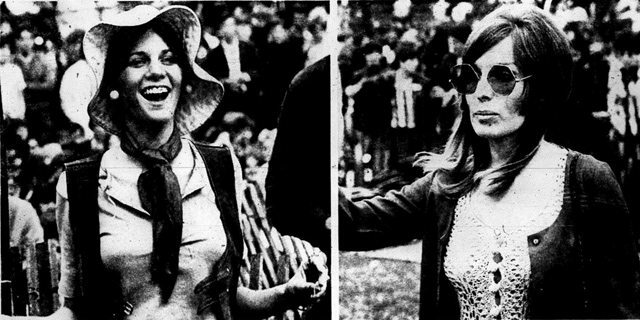 “Fans like Sheila Armroyd, 19, of Niagara Falls, NY (left) and the local girl (right) came from far and near.” The Telegram, June 23, 1969. I loved our first Pop festival. I’ll never forget the fields of fuzzed-out heads looking like a crop of orderly fungus being raked by the searchlights. I loved the plump balloons carrying sparklers into the night. And the joy of friends hurling friends in the air from blankets—white bellied fish displaying spawning fibres. And the heat of the faithful’s adulation held back by the new cool cool when suddenly coming face to beads with yet another idol heading for the stage. I admired the boredom with which they greeted David Clayton-Thomas mindless platitudes on the drug and school bit. Their enthusiasm for Chuck Berry, on old master of rock, and finally just the memory of a sleek cat wearing a Billy Bishop helmet talking softly to a perfect bird in navel drop bells about his exams, oblivious to the raunchy singer in sequined strides bellowing crotch music over the wincing transistors. His buddy was being studiously ignored by Superbell’s handmaidens as they went through the ancient ritual of letting him know some have, some don’t. Additional material from Finding Myself in Fashion by Jeanne Beker (Toronto: Penguin, 2011), the September 1969 edition of Toronto Life, and the following newspapers: the June 24, 1969 edition of the Globe and Mail; and the June 23, 1969 and June 26, 1969 editions of the Telegram.